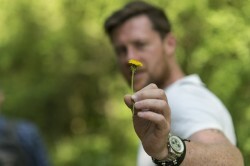 A bright sunny spring afternoon and our curious team led by expert forager Mark Lloyd heads off into Epping Forest to seek out wild food and drink ingredients amongst the surprisingly abundant flora. The invitation came courtesy of Caorunn Gin who this year are expanding their ground breaking Forage2Glass initiative centred on creating cocktails using ingredients not normally found in supermarkets. 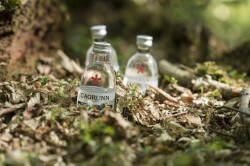 Appropriate too because Caorunn’s botanical recipe includes five very special ingredients that are gathered in the countryside surrounding their distillery in the Scottish Highlands. These are rowan berries (Caorunn is the Gaelic word for rowan), Coul Blush apple, heather, bog myrtle and dandelion. Our mission was to discover more about how to make use of the amazing variety of plants and shrubs that grow so profusely in gardens and wild areas throughout Britain. The first plant we encountered was the dandelion, a key ingredient of Caorunn Gin, and, as we learned, not just an annoyingly invasive weed but chock full of vitamins A, B, C, and D, as well as minerals such as iron, potassium, and zinc. Dandelion leaves add flavor to salads, sandwiches, and teas. Dandelion root is found in coffee substitutes, cordials and syrups whilst the flowers can be used to make wines. Another plant that people usually find about as attractive as the dandelion is the familiar ‘sticky willy’ that grows everywhere. But once we find out that this stuff can be cooked down to taste very like cabbage we see it with new eyes. Then there’s the also extremely common alliaria petiolata, aka the adventurously named Jack by the Hedge, a form of wild garlic whose leaves can be shredded to make a type of pesto or added to salad dressings. When it comes to unusual garnishes for a G & T we were spoiled for choice. Young beech leaves, hawthorn and apple blossoms, borage flowers, they all make attractive additions to our favourite drink. Or how about this for prettiness – next time you’re making ice cubes start with edible flowers such as elderflower, rose petals or nasturtiums at the bottom of the tray then fill with water and freeze as normal. Top tip here is never wash elderflowers, simply shake them. Although it’s the wrong time of the year for berries we did discover what to look for once autumn comes. Sloe berries of course for sloe gin, but also red haws from hawthorn bushes, rose hips, blackberries, rowanberries and elderberries all have multiple uses both in the kitchen and the drinks cabinet. A word of warning – not everything in the wild can be eaten. Foxgloves, gladioli and bluebells are all poisonous and, even if you are knowledgeable about plants, it’s always a good idea to check a field guide and never eat anything unless you are absolutely sure you have identified it correctly first. But right now the countryside is bursting out all over and foraging is not only good fun and eco friendly, it’s also an excellent way to cut down on the costs of your weekly shop!